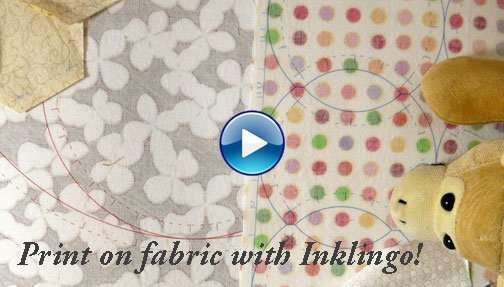 The eighth LIVE Inklingo video is intended to help all quilters—whether or not they use Inklingo to print on fabric. This video is full of great tips for using freezer paper. 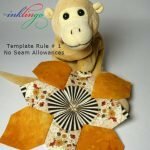 You might wonder why I teach a method that doesn’t used Inklingo but it makes total sense because Inklingo is all about making quilting more accessible. Sometimes you cannot print on fabric. On the other hand . . . . . 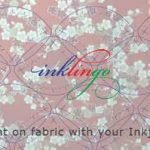 Anything you can draw or print in freezer paper, you can cut apart and sew together again. I made My Dear Jane™ quilt by hand with freezer paper templates. 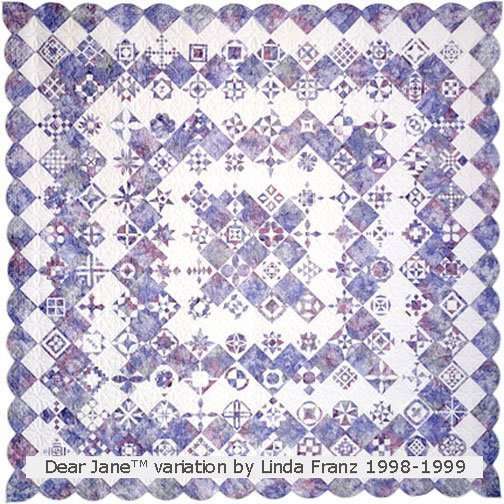 This quilt won a first place ribbon at the AQS Show in Paducah in 1999. 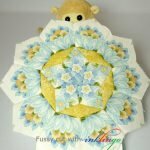 There is also a demonstration showing how to make Dancing with the Stars in Millefiori Quilts 2 by Willyne Hammerstein with Inklingo by adapting a printed shape because one of the shapes is not inklingo-able yet. 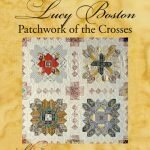 I also explained how to use freezer paper templates to make any of the quilts in The Patchworks of Lucy Boston by Diana Boston or Lucy Boston Patchwork of the Crosses (POTC), and even clothing! The demonstrations show how it is easier to rotary cut and mark sewing lines with freezer paper—not acrylic. Acrylic templates don’t do what freezer paper templates can do, so they are not the best option. 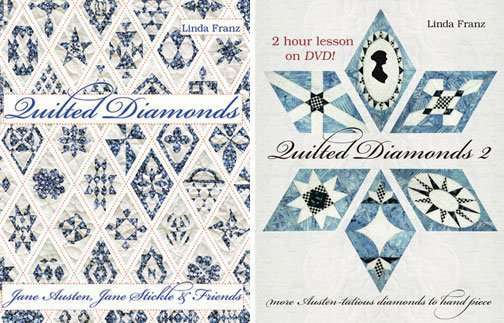 All of the information in this video is also covered in the Quilted Diamonds 2 DVD lesson. 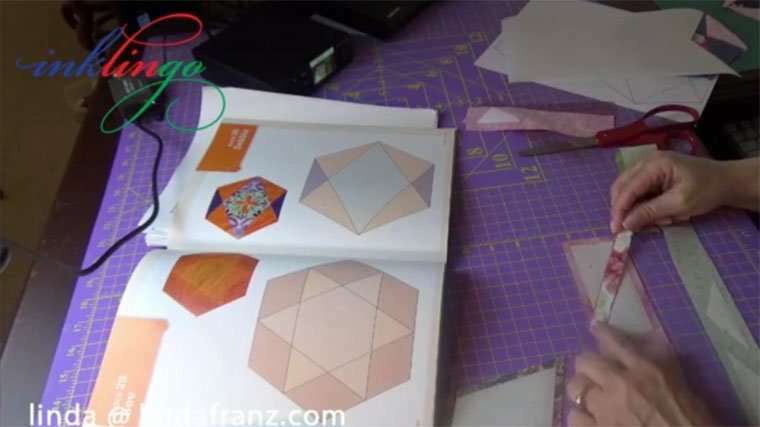 I did not do any sewing in Live Video 08 but the QD2 DVD lesson includes everything about using freezer paper templates AND all of my best tips for hand piecing. 300 Pieced Hexagons by Inklingo (PDF to download) Print all of the shapes with Inklingo or use freezer paper templates. Choice of sizes. Kathy in Mexico’s Flickr album of Quilted Diamonds blocks (fussy cut) Visit the album to see close-up photos of all of the diamonds. The best way to know what is new is to subscribe to the blog by email. It is also a good idea to check the Inklingo Facebook Page frequently because Facebook does not show you anything from Inklingo unless I pay them, even when you have liked the page. If you don’t visit, you will miss whatever is happening. Please share the Inklingo videos with your friends. This one is only 8 minutes. 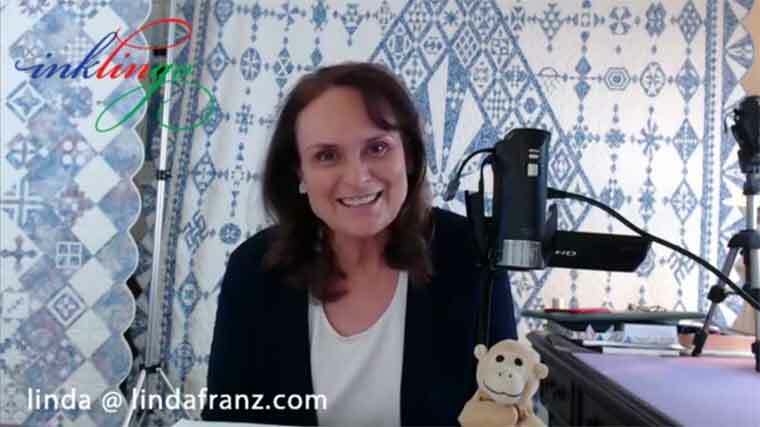 Click this image for the replay of Live Inklingo Video 08. 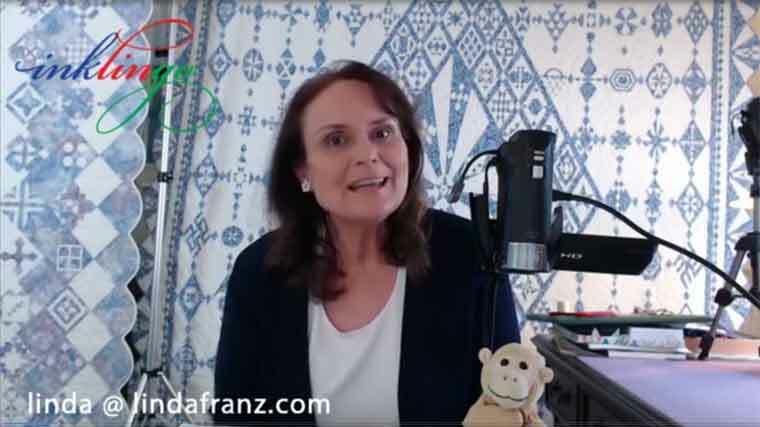 Please tell your friends and please “like” the video on YouTube. The special intro price on the new Ietsie Pietsie Pizzicato shape collection. Only $20 until midnight on Wednesday. I am learning about video as we go along. I hope this is a good way for us to get to know each other and for you to get more enjoyment out of quilting—and finish what you start! Thank you for watching and thank you for visiting. I’m glad you watched, Faye. Thank you! Thank you for your wonderful videos! Could you please tell me where you purchased the large purple cutting mat at your work table? What is the brand name? Good eyes, Karen! You are the first person to ask. That big purple cutting mat is from Martelli. It is my favorite mat. 26 x 38 inches. It was pricey but I waited for a sale. I have been using it for several years and it is still as good as new. I also enjoy using their rotary cutters. NO AFFILIATION. I just like the quality of their products. That is a great idea, Angela! I would love to see photos when you get started. I just had an epiphany after watching your video! 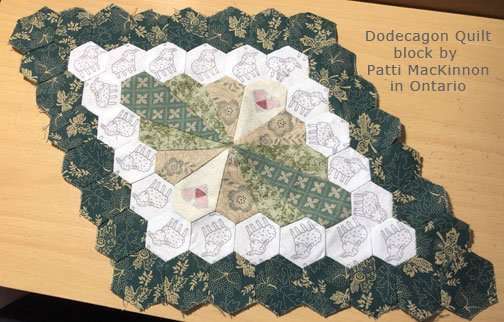 Katje Marek had a quiltalong in 2016 where she used some of her pieced hexagons to make a millefiore type quilt and I believe I can make a version of that using your 300 pieced hexagons with Inklingo instead of using freezer paper for some of the block. I’m glad you watched, Kathy. Your Quilted Diamonds is still one of my favorites. I am glad we have met and I have seen your diamonds in person. Thank you for letting me share your art. Wow!!! You covered a lot in this video. 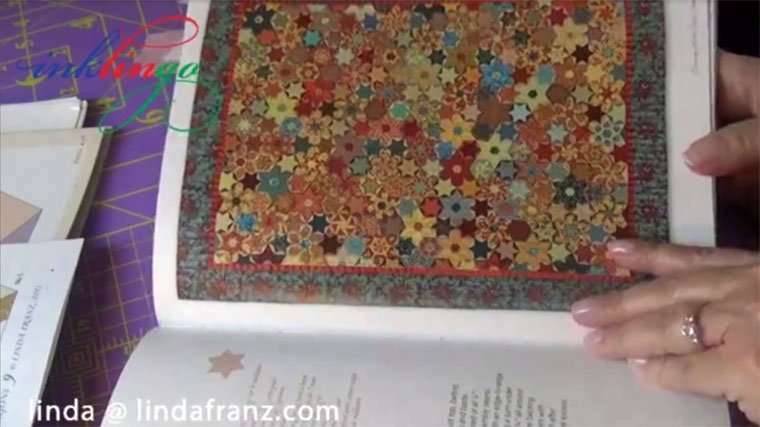 So much information that will be useful to all quilters. I have met so many quilters over the years that have no idea how to draw a pattern and take “it” apart to see the size of the pieces. Printing on freezer paper truly does open the world to design anything. And the pieces can be used over and over again. I save each block or diamond that I make in a glassine envelope and have them in photo boxes to access anytime I desire. The Quilted Diamonds were a joy to make-lots of little pieces but each seam was only a few stitches, completely doable with the freezer paper. Thank you so much for all you do-you put an extreme amount of time into all of these videos and I really appreciate them!